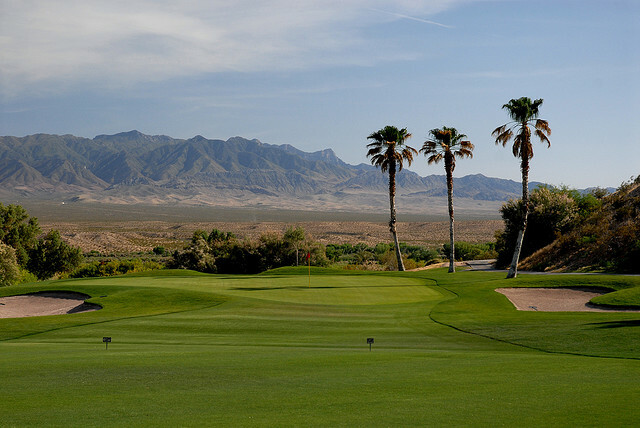 Welcome to the Palms Golf Club that straddles the Nevada and Arizona borders. With its gorgeous palm-lined fairways and beautiful, but perilous water features, the Palms offers a challenging day of golf for players of all skill levels from beginners to professionals. The Palms Golf Club is almost two courses in one, with the first nine playing with open fairways and surrounding water that then transitions to the back nine rising up to panoramic elevated tees and greens. 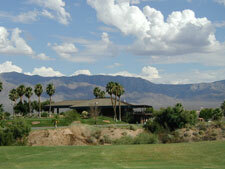 So bring your cameras and take home plenty of memories from a day on the Palms Golf Club in Mesquite. Complete golf packages and rooms are available at the Casablanca Hotel and Resort. Click Here to book our $99 Stay & Play package. Click Here to book our $50 Summer Stay & Play package. Click Here to Build Your Own Golf Getaway package. Driving Range and putting greens are available to all guests at the Palms Golf Club. 11 Golf Courses to choose from! Unlimited room nights available at the CasaBlanca Resort. Book Your Own Custom Golf Getaway Now! $99 Golf Package includes one night stay at the CasaBlanca Hotel and one round of golf at the CasaBlanca Golf Club or Palms Golf Club. Book the $99 Stay & Play Now! Book online above or call us at 1.877.438.2929 to speak to a Golf Package Coordinator. You can also book tee times at either course with a Pro Shop representative. Welcome to the Palms Golf Club. We hope you enjoy your round today. A good drive on this slightly downhill par 5 must avoid the large palm tree on the right. Third shots need to carry deep bunkers to the left, right and back of this large green. A dog-leg left with a large pond that runs down the left of the fairway. Palm trees and bunkers line the right while this elevated green is surrounded by bunkers. A long par 3 with water on the left and a large island bunker on the right. Bunkers are also lurking behind this fairly flat green. The number 1 handicap hole is a dog-leg right with a water hazard on the right that is hidden off the tee. Bunkers are strategically positioned to the left. Water lurks beyond blind second shots. A layup and a third short wedge shot is recommended. Stay well left on this generous fairway to avoid water on the far right while twin bunkers guard the left. A good drive opens to a long narrow green. Water on the right is reachable off the tee. Prevailing wind usually makes this hole play longer requiring an accurate second shot to this small green. Water runs behind the green to catch any shots that go long. A large green is surrounded by water hazards in front and back. A bail-out area sits to the left of this two tiered green. Cut some distance off this dog-left, but beware of the pond that comes into play either off the tee or on second shots. A deep bunker is just short and right of this oval green. This long par 4 leads back to the club house with more water on both sides of the fairway and a huge bunker on the right. An accurate second shot puts you on a large undulating green. You’ll think you’re on an entirely different course as you start the back nine. This sweeping par five plays downhill to a green complex surrounded by palm trees and bunkers. A beautiful downhill par 3 that is all carry over a natural desert area that also surrounds the green. A demanding tee shot is needed to climb this fairway that climbs well uphill. Number 12 plays one to two clubs longer as you approach this long and narrow elevated green. A short dog-leg left with plenty of bunkers to the left and desert areas to the right. The green appears hidden from the tee and requires an accurate second shot. Visually spectacular, this par 3 requires a tee shot to clear a dangerous ravine and desert area left and right. A small bail-out area leaves an uphill chip to an elevated green. The signature hole at the Palms has a panoramic 115 foot drop from tee to fairway. A long, accurate tee shot is needed to reach the fairway that plays considerably downhill. A canal guards the right and the desert to the left. Finding the fairway is crucial to avoid a big number. Another short, but tricky par 4. Water on the right is reachable off the tee and a canal lurks on left. The fairway moves slightly to the left and leads to an elevated green. An elevated tee overlooks water hazards and bunkers left and right. The fairway turns slightly right requiring a second shot that must stay out of the desert close by the green. A long par 4 made even longer with the fairway running entirely uphill. Second shots may need one or two extra clubs to miss bunkers on both sides of the large green. Thank you for playing the Palms Golf Club. Come back again soon!